The go to talking point on the campaign trail for Republicans is to blame President Obama for the state of the economy as if the President is the only person who had a chance to deal with the broken economy he got when he took office in 2009. 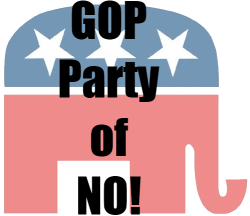 What Republicans don’t do is point out their party was the party of NO! blocking many of the President’s initiatives to better the economy. If the economy is not doing as well as it should be, the fault rests with the Republicans in Congress. 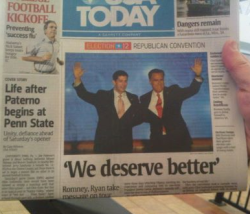 This entry was posted in History, Life, Media, Politics and tagged 2012 US Presidential Election, fact checking, false talking points, GOP, GOP Fail, lies, Mitt Romney, obama derangement syndrome, Party of NO!, political lies, Republicans on August 25, 2012 by Doug. Just amazes me that a sitting Senator of the United States would actually LIE on national TV. Senator Lindsey Graham (R-SC) was on Fox “News” Sunday and told the whopper that the Bush Tax cuts would pay for themselves. I understand why Fox “News” didn’t challenge him but why do they still lie like they do in public? In fact, the Center on Budget and Policy Priorities (CBPP) found that the Bush tax cuts accounted for almost half of the mushrooming deficits during his tenure. As another CBPP analysis forecast, over the next 10 years, the Bush tax cuts if made permanent will contribute more to the U.S. budget deficit than the Obama stimulus, the TARP program, the wars in Afghanistan and Iraq, and revenue lost to the recession put together. Predictably, the Bush tax cuts didn’t come anywhere close to paying for themselves. And as Congressional Budget Office projections revealed in June, making them permanent is the very worst thing the so-called deficit hawks could do to reduce the U.S. debt. “I think anyone who doesn’t give credit to the system that they are born into is taking an awful lot onto themselves. I mean, I really think that people have sacrificed a lot more than a little tax money to make that system available for all of us. And I would be ashamed of myself if I didn’t give some credit to them,” Steyer said, choking up and pausing to regain his composure. This entry was posted in Culture, Media, Politics and tagged Bush tax cuts, cheap labor conservative, economic meltdown, Fox News Sunday, GOP, lies, Republicans, Senator Lindsey Graham, wealthy on November 29, 2010 by Doug. In this episode Doug rants about the blatant lies favored by people who are part of the Republican party and he mentions again some upcoming TV shows in the fall and waxes about the coming football season. This entry was posted in Culture, History, Life, Media, Politics, Sports, Television and tagged fall TV season, Football, lies, Podcast, Republicans, unemployment on July 20, 2010 by Doug.